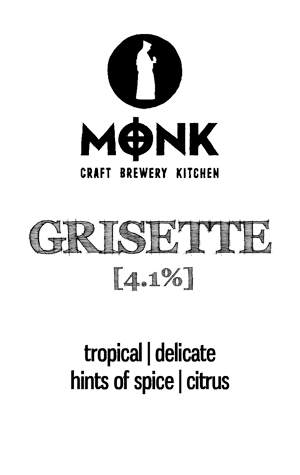 Starting with the idea of creating a “mid with more”, Monk head brewer Mal Secourable considered the table beers of the past that would have been consumed in a Monastery. The grisette style, a typically lower alcohol relative of saison, lends itself to more subtle flavours and reduced alcohol thus perfectly fit the brief. Aromas of nasi pear, citrus, yeast and light spice follow through to the palate, while the pale straw coloured body holds an elegantly tight carbonation provided by the French saison yeast that also drys the finish and makes this a very enjoyable quaffer with which to watch the parade along Freo's South Terrace from the brewery’s elevated position.